This message was preached by Colin D'cruz at Word of Grace Church on November 18th, 2018. To listen/download the audio please click here. To listen to the Sunday's worship and prophetic contributions please click here. Let’s get into the word of God this morning. As we refer to the verses, turn to them. It’s important that we check the word of God and see that everything the preacher says is in the word of God. Paul wrote many of the books of the bible. In Acts 17:11 “Now the Berean Jews were of more noble character than those in Thessalonica, for they received the message with great eagerness and examined the Scriptures every day to see if what Paul said was true” So we need to receive the word of God with eagerness. And secondly, they checked Paul’s words, if they lined up with scripture. This morning, as we go through the word, that’s what I want you to do. Take down notes as well so you can meditate on it later. Christmas is coming and one the things children associate with Christmas is gifts. We all love to get gifts. Gifts are even better when they are promised beforehand. Sometimes we get so excited that we can’t sleep! That’s in the natural. What are the gifts that have been promised to us in God’s word? Acts 2:38 “When the people heard this, they were cut to the heart and said to Peter and the other apostles, “Brothers, what shall we do?”38 Peter replied, “Repent and be baptized, every one of you, in the name of Jesus Christ for the forgiveness of your sins. And you will receive the gift of the Holy Spirit. 39 The promise is for you and your children and for all who are far off—for all whom the Lord our God will call.”” These are the instructions Peter gives to the people who have first heard the gospel. 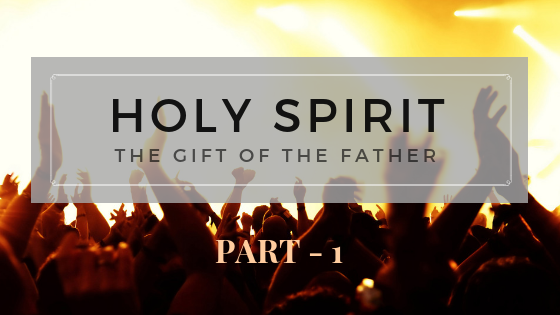 The Holy Spirit is the gift that is promised to each and every one of us. Q. Are we as eager to receive this gift of the Holy Spirit as we are to receive a natural gift? Acts 1: 4 “On one occasion, while he was eating with them, he gave them this command: “Do not leave Jerusalem, but wait for the gift my Father promised, which you have heard me speak about. 5 For John baptized with water, but in a few days you will be baptized with the Holy Spirit.”” This gift is a promise from God the Father himself. Let’s pray! How many of you know that Jesus is the Lamb of God? most of us! But this is only mentioned in the gospels once. But 4 times in the gospels it is mentioned that Jesus baptises with the Holy Spirit. Matthew 3:11- John the Baptist talks about how Jesus will baptise us with the Holy Spirit and fire. We see the fulfilment of this promise in Acts 2. Jesus died, rose again, appeared to his disciples and before ascending to the Father, he asked them to wait for the Holy Spirit. On the day of Pentecost, the Holy Spirit came over the people and all were amazed! It seemed like they were drunk, but they were not. When the Holy Spirit comes upon Christians, we have to be different. Firstly, we have to be saved. Believe in our heart and confess with our mouth that God raised Jesus from the dead. When we do that, a miracle will take place in our life. After that we have to be baptised in water. It means being immersed in water. The next thing is that we receive the gift of the Holy Spirit. This is different from the Holy Spirit working in our lives to draw us to salvation. Q. Were the apostles born again when Jesus was on earth? Yes! The Holy Spirit was already working in them, but they were not yet baptised with the Holy Spirit. Even when Jesus rose from the dead, the disciples were fearful. They met the risen Jesus, but they did not tell anyone about Jesus. They did not have the power to proclaim the gospel. They waited 10 days. But when the Holy Spirit came they proclaimed boldly, were to temples, healed people, cast out demons, the whole of Jerusalem had come to hear the name of Jesus. The result of the baptism of the Holy Spirit is great boldness just as the disciples had. Acts 8- 4 “Those who had been scattered preached the word wherever they went. 5 Philip went down to a city in Samaria and proclaimed the Messiah there. 6 When the crowds heard Philip and saw the signs he performed, they all paid close attention to what he said. 7 For with shrieks, impure spirits came out of many, and many who were paralyzed or lame were healed. 8 So there was great joy in that city” When we are filled with the Holy Spirit, we have the power and boldness to do this. In verse 14-17 “When the apostles in Jerusalem heard that Samaria had accepted the word of God, they sent Peter and John to Samaria. 15 When they arrived, they prayed for the new believers there that they might receive the Holy Spirit, 16 because the Holy Spirit had not yet come on any of them; they had simply been baptized in the name of the Lord Jesus. 17 Then Peter and John placed their hands on them, and they received the Holy Spirit.” These were believers. But they had not yet received the baptism of the Holy Spirit. Here it happened as hands were laid on them. Acts 10: 44- 46 “While Peter was still speaking these words, the Holy Spirit came on all who heard the message. 45 The circumcised believers who had come with Peter were astonished that the gift of the Holy Spirit had been poured out even on Gentiles. 46 For they heard them speaking in tongues and praising God.” We’ve seen 2 ways in which the baptism of the Holy Spirit happens. Jesus baptises us in the Holy Spirit. We are immersed in the Holy Spirit. Q. Are you baptised in the Holy Spirit? You’ve got to know the answer. It is either yes or no. It is not automatic. Acts 19: 1- 2 “While Apollos was at Corinth, Paul took the road through the interior and arrived at Ephesus. There he found some disciples and asked them, “Did you receive the Holy Spirit when you believed?.” You can believe in Jesus and baptised in water and still not be baptised in the Holy Spirit. Q. What does this do? 2 Corinthians 1:21-22 “Now it is God who makes both us and you stand firm in Christ. He anointed us, 22 set his seal of ownership on us, and put his Spirit in our hearts as a deposit, guaranteeing what is to come.” The baptism of the Holy Spirit is a seal on us to mark us as authentic believers- it is a guarantee of what is to come. When the apostle Paul was talking about his ministry in Romans 15: 18-19 “I will not venture to speak of anything except what Christ has accomplished through me in leading the Gentiles to obey God by what I have said and done— 19 by the power of signs and wonders, through the power of the Spirit of God. So from Jerusalem all the way around to Illyricum, I have fully proclaimed the gospel of Christ.” We can keep coming to church meetings but that is not enough. We need this power of God- that people will sense the holiness of God in your presence. Paul was so anointed! Acts 14:8 “In Lystra there sat a man who was lame. He had been that way from birth and had never walked. 9 He listened to Paul as he was speaking. Paul looked directly at him, saw that he had faith to be healed 10 and called out, “Stand up on your feet!” At that, the man jumped up and began to walk.” We want to see this happening in our lives as well! The Father has promised us a gift and that is the power of God through the Holy Spirit. Jesus said if anyone is thirsty let him come and drink. My prayer is that we will all be filled with the Holy Spirit that we transform the world. Let’s pray.